By the mid 1950’s Ealing Studios, that great purveyor of British cinematic whimsy, was running out of steam. 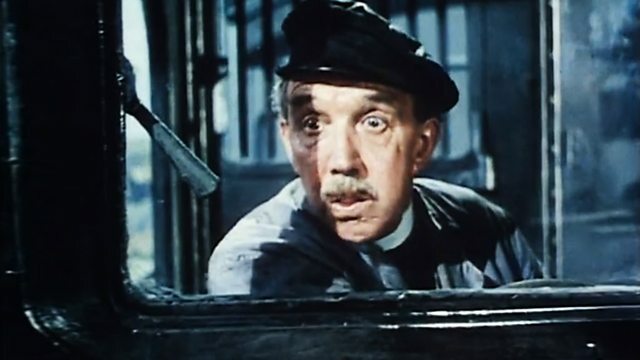 Though this period saw them release such iconic titles as The Ladykillers (1955), their heyday of the late 1930’s and early 1940’s in terms of output (between 1936 and 1937 alone they turned out an impressive 21 films), was fast becoming a distant memory. From the late 1950’s onwards the studio saw their trademark style of dry, laid back humour increasingly sidelined by the newer bawdy approach of films like producer Peter Rogers’ popular Carry On series. In light of this The Titfield Thunderbolt (1953), starring Stanley Holloway, Hugh Grifﬁth and Sid James, can now be seen as not only an ode to the glory days of the steam train, but to several other aspects of British life, including the ubiquitous presence of Ealing, which are now a thing of the past. The rural train link between Titﬁeld and Mallingford is the lifeline of the local community, used by the villagers for their daily commute as well as to transport livestock to the weekly market. So when it’s announced that the branch-line is to be closed down by the Government run British Railway Service, there is understandable consternation. In a last ditch attempt to save their beloved railway a group of train enthusiasts, led by the village Vicar (George Relph) and local Squire (John Gregson), decide to take matters into their own hands. With the backing of wealthy villager Walter Valentine (Holloway) – who agrees to help on the condition they install a bar with extended opening hours in the passenger car – the group take on the might of the Whitehall bureaucrats, as well as the fiendish machinations of a local bus service, with predictably hilarious results. Directed by Charles Crichton (who’d been responsible for the studio’s previous hits Dead of Night (1945) and The Lavender Hill Mob (1951) and ended his career on an Oscar nominated high with the marvellously batty A Fish Called Wanda (1988)), The Titfield Thunderbolt is one of those rare things in cinema – a ﬁlm which is virtually perfect in all respects. Everything sparkles in this story of a group of villagers who fight to save their local railway line when it’s threatened with closure. Shot in dazzling Technicolor (the film was the first time the studio had used the process) the train and bucolic countryside through which it steams, spring from the screen with a wonderful vibrancy and depth captured by the legendary cinematographer Douglas Slocombe who went on to work on such classics as Anthony Harvey’s The Lion in Winter (1968) and Steven Spielberg’s Indiana Jones films during the 1980’s. More importantly however is the way the film can be seen as an exercise in social commentary. Its evocation of many aspects of British everyday life, particularly the powers of a nationalised train service, which were once taken for granted but are now relegated to the history books, will likely appear startling to many modern audiences. In the current climate when the quality of train services is a hot topic amongst commuters in the UK and elsewhere, the rerelease of a story about of a group of people who take the powers that be on at their own game, and ultimately do a better job, seems timely. The film’s recreation of a country village where people interconnect with their neighbours and act together for the universal good, may also seem idealistic today. However, seeing the cast of British eccentrics – brought to life by such instantly recognisable character actors as Godfrey Tearle and the comic genius that was Sid James – you cannot help but be touched as they pull out all the stops in a bid to save their beloved railway service. As a result by the end of the film you actually find yourself yearning for a time when people cared about something outside of their own, insular existence. StudioCanal’s rerelease of The Titﬁled Thunderbolt, digitally restored by Pinewood Studios to mark the film’s 60th anniversary, comes with a host of extras including a location’s featurette, restoration comparison, home movie footage by cinematographer Douglas Slocombe and original trailer. Watched now this gem from the archives of classic British cinema is a wonderful postcard from an age when everything, including the railways, ran on time, and life was just that little bit pleasanter as a result.